Happy Christmas, Happy Holidays, Happy New Year and all that. Continuing on with the unintentional Italian theme, I have had the great pleasure to dine at two really awesome Italian restaurants recently, dell’anima and L’Artusi, which happen to both be owned by Epicurean Management Group –folks over there must be doing something right. EMG has another restaurant in their little ring of deliciousness, L’Apicio, and also, Anfora, the bar sibling to dell’anima in the West Village. dell’anima opened in October of 2007 and has become a neighborhood favorite (well clearly, or it wouldn’t still be there). dell’anima means “of the soul,” In Italian (isn’t that nice?) 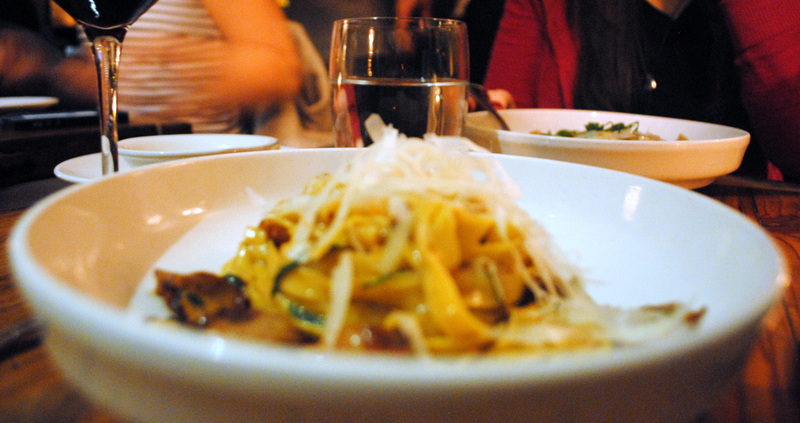 and the restaurant aims to create soul-satisfying, flavorful, rustic, Italian cooking, which they do, offered at a very intimate, tightly packed restaurant. 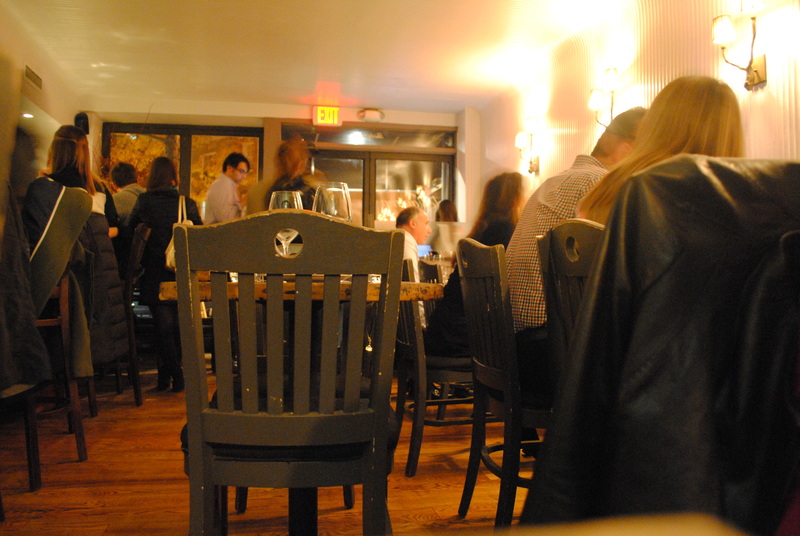 The joint’s not really set up for group dining, and even if you’re two you’ll feel like you’re sharing a table with the people sat next to you, but all in all, the ambience is cozy and the food is good enough that you won’t be complaining (too much). The menu is broken down into bruschette, insalate, antipasti, primi and secondi and trust me, ordering 2-3 dishes per person is plenty. 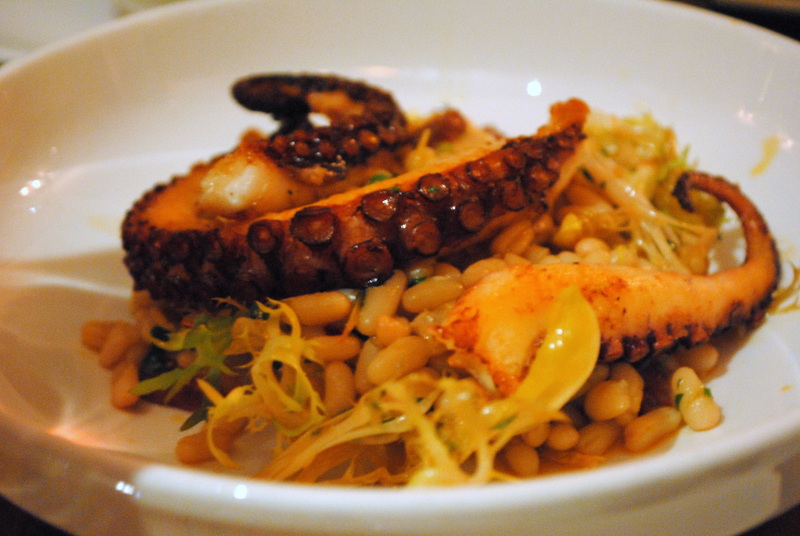 The charred octopus ($19) is served with rice beans, chorizo, and chicories, giving it that heartier, bitter edge. The plate and textures were a bit busy but, the beast has a weakness for grilled octopus of any kind and this one was nothing short of pleasant. Now, I would never normally order a salad in a restaurant – paying for lettuce really irritates me. If I’m going out to dinner and I’m going to shell out money, it’s not going to be on a leaves. However, since the restaurant actually provided this on the house (cheers for that guys), I obviously ate it. I mean, that would have been pretty rude not to. And it weirdly turned out to be one of my favorite things I ate that night. 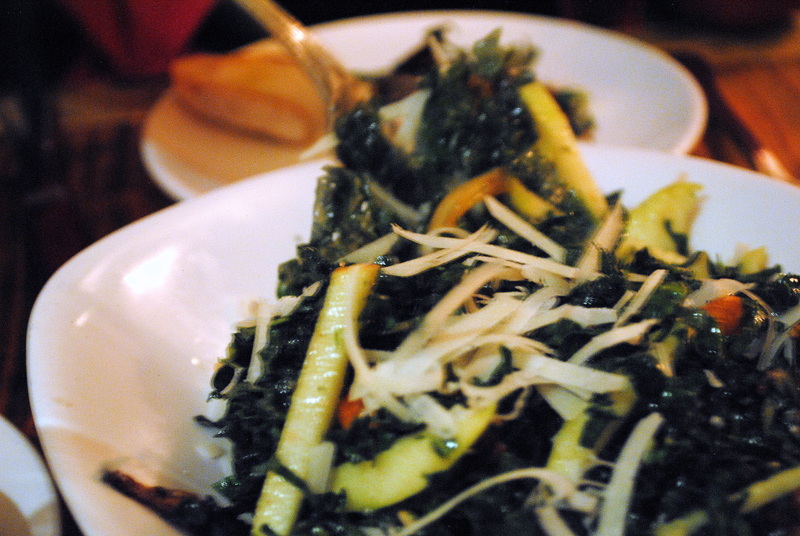 Tuscan kale salad with roasted asian pear, hazelnuts, fennel, apple and topped with pecorino romano ($12) was fresh and filling — the former I would always expect from salad but the latter, never. The sweetness of the pears and apples, combined with the nutty sweetness of the hazelnuts made the salad, dare I say it, enjoyable. The papparadelle integrale ($18) was perhaps the most disappointing. If the goal of dell’anima is to do simple Italian dishes but do them brilliantly, then this is where they didn’t meet that goal. The dish has all the right components: oyster mushrooms, shallots, thyme, aleppo, pecorino but it was just standard, not pleasing — it in no way enhanced my meal. The beer-braised short ribs ($29) were pretty fantastic — short ribs tend to be larger and meatier (which is pretty much what the beast is all about) than their pork counterparts and generally more tender. Braising the short ribs in beer really brings out the heartiness of this meaty dish. 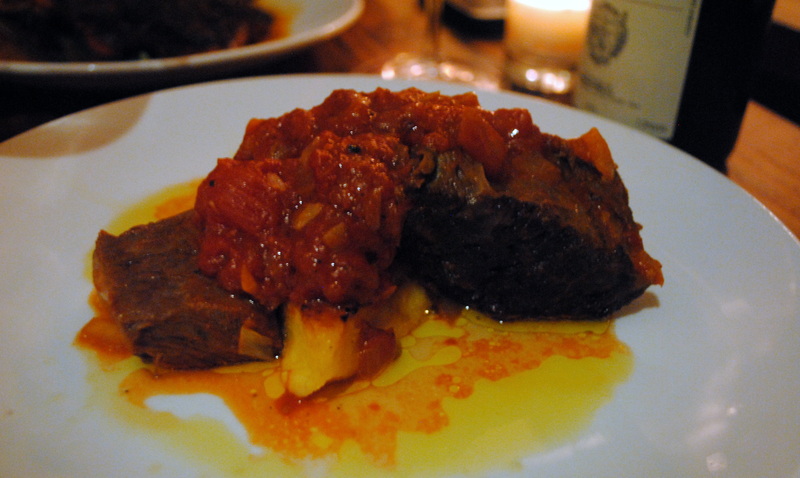 Served with homemade tomato sauce, and polenta, this was rich and intense, but in a good way. Top notch dish. All in all, a great meal (though it came with a hefty price tag, although, that may have been due to a particularly pricey bottle of wine). L’Artusi, its sister restaurant, definitely gives it a run for its money though– stay tuned for more from the beast on that front in another tale to come. 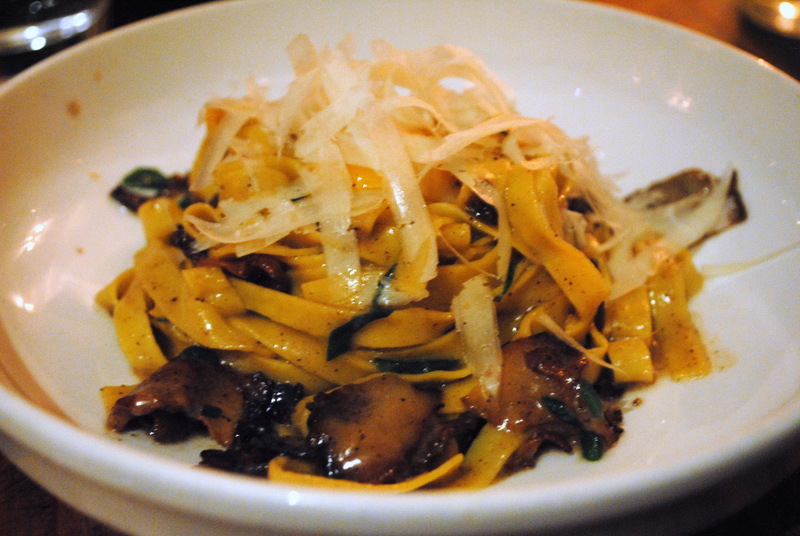 Posted in Restaurant Reviews - New YorkTagged beer-braised short ribs, charred octopus, dell'anima, dinner, eloquent, Epicurean Management, Gabe Thompson, Greenwich Village, hearty, Italian, Joe Campanale, Kale, L'Artusi, New York, Pasta, simplisticBookmark the permalink.